This is an ideal cast on to use with the brioche stitch. 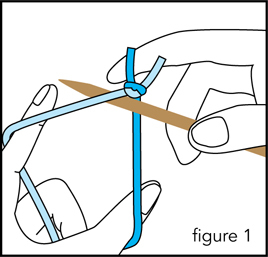 It has the correct amount of elasticity and begins with a knit and a purl stitch, there is not edge as when using the long tail cast on. 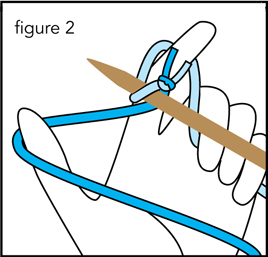 Begin by tying both strands into a knot and hold the yarns on the needle as in Figure 1. The lighter strand is the LC and the darker strand is the DC. Depending on whether you want to begin your first working row with a knit or purl stitch, will determine which cast on stitch you work first. If you cast on too many stitches, it doesn’t matter, since you can undo them after you have worked the first Set-Up Row. We are going to starting and ending with a LC knit stitch. 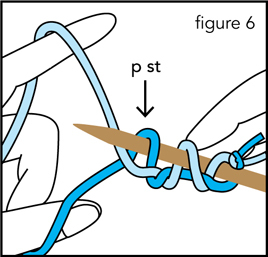 Knit LC st: steer the needle clockwise in front and under your thumb DC yarn, then over and behind index finger LC strand (figure 3, follow the arrow). 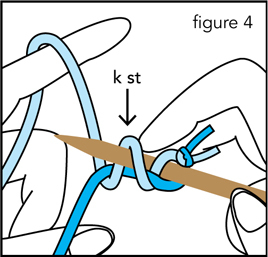 Catch LC strand on needle tip and bring it back under the thumb DC strand, returning to original position. Purl DC st: move the needle counterclockwise over and behind, then under the LC strand and under DC strand, going then in front of DC yarn, picking up a loop of the DC yarn. Bring it back under LC strand and return to original position. Repeat the knit and purl steps until an UNeven number of stitches are hanging on the needle including the first knotted stitch. You should have a DC as last st on needle. 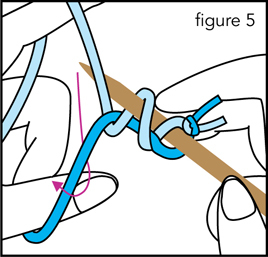 Then work one more knit LC st, hold DC thread in back and remove the LC st and work a half hitch with the LC (figure 7). 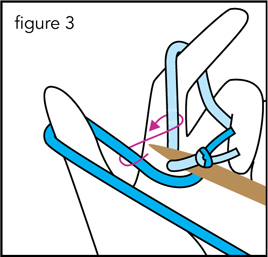 The initial knotted stitch will be dropped at the end of the first worked row.